Beyond Good & Evil 2's in pre-production, but why are the funny animals super serious now? Beyond Good & Evil 2 is officially in pre-production... unless it's some other game that stars humanoid pigs, sharks, and rhinos. Series designer Michel Ancel shared another piece of art on Instagram that appears to be related to the long-absent sequel and provided a brief but sorely needed status update in the caption. Endangered species - now saved - Game in pre-production - Stay tuned ! The Carcharodon sapiens of this new high-definition world are way scarier. I would have been a bit more hesitant to school Francis in future-air-hockey if he looked like the man(eating) shark on the right. 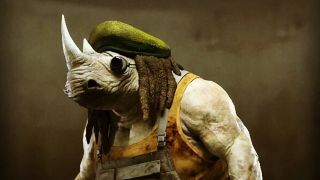 He's traded the rasta cap for a beret and grown out his dreadlocks, but I'm pretty sure this Rhinoceros sapiens is Hal from Mammago Garage. His family worked wonders on the Hovercraft in the first game and I imagine Jade will have plenty more work for them in Beyond Good & Evil 2. Unless we're looking at a flashback, I don't think this adorable Sus sapiens child is Jade's trusted friend Pey'j. But even in this concept art you can see how wispy white fur and expressive eyes give this species of cartoon animal a new look. So far, I'm not totally sold. I grew to cherish the independent animation vibe the original game's disproportionate characters and environments cultivated and I'd hate to see that toned down or eliminated in the pursuit of photorealism. Sometimes you don't want to know what a shark with arms and legs would look like IRL, you know? Besides, that's already quite well established.